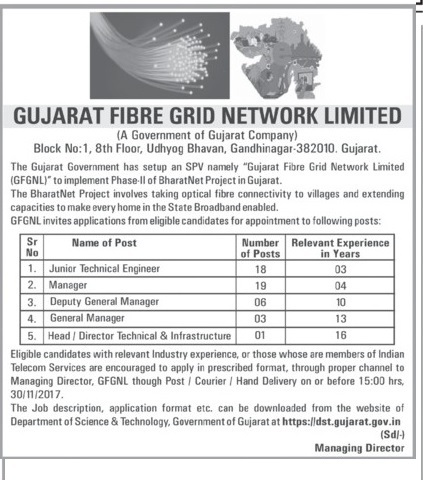 Gujarat Fibre Grid Network Limited (GFGNL) has published Advertisement for below mentioned Posts 2017. Other details like age limit, educational qualification, selection process, application fee and how to apply are given below. How to Apply: Eligible candidates with relevant Industry experience, or those whose are members of Indian Telecom Services are encouraged to apply in prescribed format, through proper channel to Managing Director, GFGNL though Post / Courier / Hand Delivery on or before 15:00 hrs, 30/11/2017.